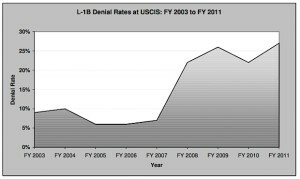 After the H-1B visa lotteries of 2007, 2008 and more recently in 2013, due to the strict annual quota of 85,000 visas, many large multi-national companies and indeed smaller ones turned to the L-1 visa as a way to get high skilled and much needed foreign talent to work in the US. The general criteria for the L-1 visa is the company must have locations in multiple countries and the foreigner must have worked at least one year in that foreign location. Some companies have abused this L-1 visa, however the real reason it is being used by companies like Microsoft and up and coming companies like Square and Airbnb is because the high-skill talent is needed and current US Immigration law is arcane and Immigration reform just never seems to get done. However the USCIS has decided under some form of direction to go completely crazy with these application petitions and reject first time and renewal application at an alarmingly high rate and for respectable companies like the Big 4 Accounting firms and tech giants like Microsoft and Google let alone the smaller companies. This is causing havoc not just for the companies but for the foreigners and their families themselves and underlies the huge flaws in US Immigration for legal, law abiding and high skill immigrants. 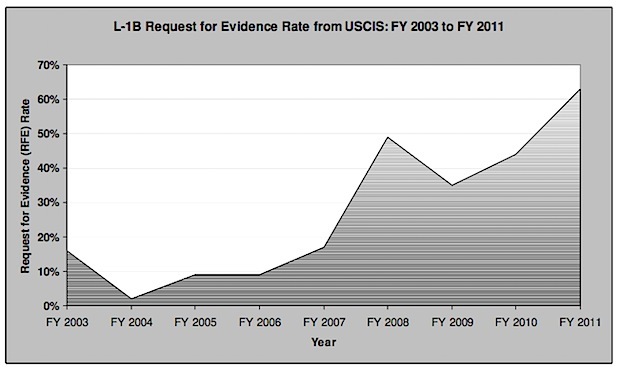 In Chart 3 you can see that in the middle part of the decade this may have disproportionately affected Indian nationals particularly at companies like InfoSys and Tata who had been accused in past (although not proven) to abuse the L-1 Visa system. However given the sharp drop in L-1 visa holders from Indian applicants in recent years but the continually high rejection rate it shows that either or both of Indian applicants are continuing to be scrutinized most and this sweeping high rejection rate is affecting all foreigners and thus the US economy at large.